A well-attended game day which went pretty smoothly, with the majority finding groups to play with and games they wanted to play. A successful dinner order thanks to Emily. People came from Ra’anana, Rehovot, Beit El and Haifa, coming and going all day and evening, so I almost had enough chairs. Heshel brought and taught this. After the explanation, Avi arrived and took my place. I was going to help him, but he understood the game very quickly and came up with beneficial actions faster than me. First play for Sara, Elisheva, Avi and Saarya. Elisheva did well with military. Sara was ahead most of the game. Eitan accidentally knocked pieces around during set-up. Ofer let them keep playing with his game when he left, they played well past midnight. Lots of colorful pretty dice. First play for Sara and Avi. Everyone did well, it’s a bit easier 3-player and the provinces were relatively equal. First play for Heshel and Elisheva. Jon usually wins but the rest of us keep improving – good job Gili! One of Eitan and Emily’s new games. Binyamin and Zvi Yehuda stopped playing during the second round. We played on the river side for the first time – there are only six mountains, nothing can be placed on river squares, and it acts like a mountain for mines. Jon was the only one to do anything differently, he built a bridge, but it gave me an extra point as well as him. I lost all my gunfights, in general I tried to avoid them. But losing the fights gave me two extra cowboys at the end which helped. In the last round Jon placed a cowboy on a house near buildings belonging to me and Eitan, so I placed one on a house near Jon’s buildings, which made him lose more points than I did. I had the sheriff only in the third round. Jon rolled poorly, once messing up the board and throwing the dice off the table in the same roll. Eitan won more gunfights but had only played once before. Jon wanted a break with a light game. He fought with Binyamin over the black car, Jon had a lot of cards that helped black, but eventually gave up in the auction. Binyamin’s black car easily came in first. I was in second place until almost the end, but then didn’t have any more cards that helped me, and I had to help other people pass me. Binyamin and Eitan each had two cars. Ofer brought and taught this. He defended against Gili and Zvi Yehuda, who succeeded in defeating him. Another of Eitan and Emily’s new games. Eitan, playing Carson City, knocked a game box onto their gameboard, so they lost some information relevant to playing. They got a rule wrong which benefitted Abe. Emily taught this to them while managing the dinner order. Eszter arrived later in the evening with her sister and brother-in-law. Jon taught them the game while playing Puerto Rico. First play for everyone except me, first time I played with correct rules. I tried to teach the game even though I realized that I didn’t know it well enough; but supplemented with the rule book it was still faster than starting from scratch. Hershel had the lowest poverty and did the best at not taking loans, Elisheva was tripped up by hers. Jon had three and still did well, I had one. As in earlier plays, the game finished faster than expected. I explained the game, then Saarya took over using the rule book, and Avi had played before. 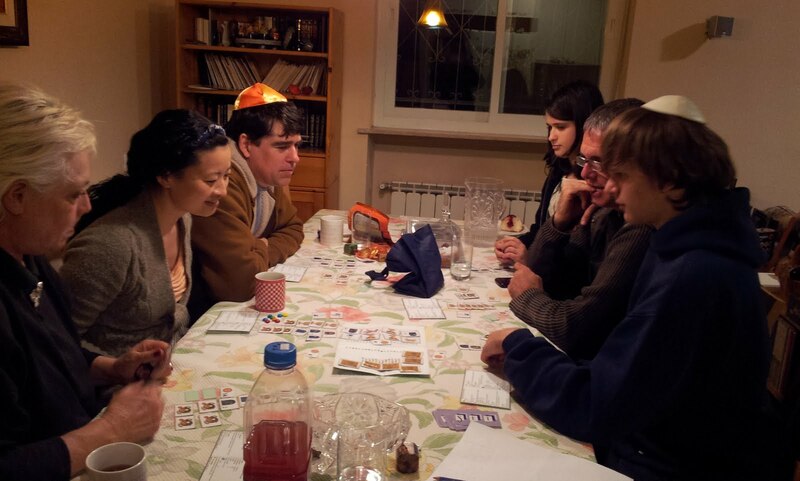 Devorah’s first time playing a Eurogame, she showed up in the evening after seeing a post on janglo, she didn’t know anyone. I took over for Laurie at the beginning of the last round when she had to leave, but she was in a great position, with a chip and enough money and markers so I could get 5 chips to fulfill 3 mission cards. Gili did a good job explaining and running the game, and we played her variant where the harder mission cards are 6 and 7 points instead of 5. Kate and Moshe play this a lot, but get different buildings than we do. I wanted to see how it would work to play with them. They were a bit distracted by their tired toddler, Chana Tova. Kate started off with Hospice and got Residence at the end. Moshe had Hacienda and Construction Hut, crafted a lot, and got a late Tobacco, and no big building. I didn’t get a big building either, I got a Wharf instead, which gave me at least 10 points. But when I traded Coffee before Jon did at the beginning of the game, I got a Harbor instead of a Factory; Jon took a Factory next round. He ended up with Guild Hall and Fortress, which was just enough to beat my shipping. Jon was first player, Kate second, me third and Moshe last. Ruth arrived and took over for Avi, who had to leave. 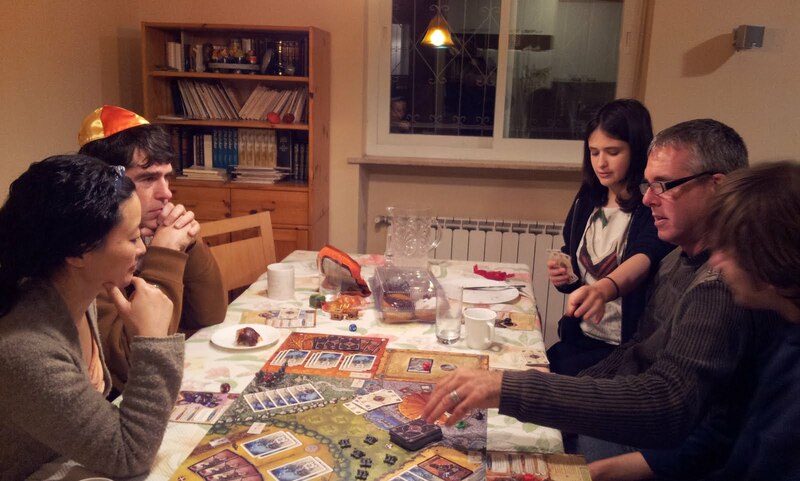 Ruth has little game experience, Moshe is an experienced wargamer. Binyamin explained the game. They played without a traitor. The game ended with 6 white and 6 black swords. Mace flew in from Australia; Liza is a friend of Bill and Shirley’s, who also flew in for a few weeks. Bill won, beating Shirley by 3 points. Shirley started, Bill was second, which is an advantage when the pot is only refilled by ante. We played with m&m’s, two or three rounds. First time playing Dreidle for Bill and Shirley. By the end, we managed to get faster at it. Mace did particularly well and was the first to be willing to be timed, he got 2.5 in the two minutes. But it’s not easy, and again everyone said it didn’t really feel like a party game. Mace 13,13,29; Liza 12,19,29; Shachar 1,6,20; Shirley 7,7,20; Bill 0,-7,9. I asked Bill to get this out of the drawer. He couldn’t find it until Mace pointed it out, I forgot that the title is in Hebrew. When Liza arrived I let her take over for me, Shachar and Shlomia teamed up. Two ties and Bill, at least he didn’t end up negatives. He had a lot of Tribes but not much else. Disasters didn’t show up til second and third yovels, but then a lot did of course. Some suspense at the end of yovels waiting for the last mosaic. First play for everyone, they got it by the second round but were slightly hurt by not understanding everything at the beginning. It worked well with five, everyone liked the game. Rather than caring about winning, everyone’s goal was to be the traitor. Mace played very cagily at the beginning, in case he became the traitor. We passed out the cards at 5 swords. Liza had left, so it was 6 cards out of 8. After that everyone was cooperating well, and Mace committed himself to winning as a team, and as we suspected, there was no traitor. We won with 7 white swords. Shlomia did well, winning Excaliber and the solo knight quest, Shachar got the grail. 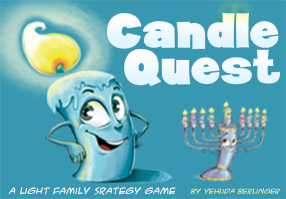 Upcoming: Mini Chanukah game day on Sunday at Gili’s, and regular games next week on Wednesday. We played when Eitan arrived first. I had printed out the rules, but forgot that my version has different animals so I had to translate them. I do own a game but it’s somewhere else. Eitan caught on and thought and planned well. We played correctly this time except I didn’t check who starts first in new Yovels, we just kept going in order. First Yovel I had 7, Eitan -5 and Gili -6. Next one I had 26, Eitan 6 and Gili -5. It seemed like luck that things worked out for me, though I did decide well on calling auctions several times, and second Yovel I had two auctions to myself because I’d had low money amounts. It’s an interesting game. We won! 4 players, no traitor. We waited to add a traitor after six swords, but then decided we better not, it would be too hard to win. And Gili didn’t want to get the traitor card. Emily and Eitan brought two of the few games they have, this and Gosu. They like Citadels and play a lot, but the two-player game is different, faster and better. I didn’t like the game, too random; Emily and Eitan didn’t like it as much 4-player. I focused on finishing the game to get the extra points even though I didn’t calculate whether I would win, ending was my best chance. Gili wanted to check this out for her kids, and we ended up playing it because the others hadn’t seen the newer version that I have. Gili decided it was very similar to her Pirate version so didn’t borrow it. I like not going to college, my salary was fine, and I switched with Emily’s 100,000 towards the middle, then Eitan took it from me near the end. I still wouldn’t have won, but I lost a lot by selecting Millionaire Estates. Even though I had more money than Eitan who went there too, he took 3 Life cards away from me when the pile ran out, and the 4 I gained were all only 50,000, so I lost a few hundred thousand there. Eitan had a lot of Life tiles. About 5 people RSVP’d to come at 7. Gili, so she never got her turn. Shadows which was fun. It was Abe’s second time playing Year of the Dragon. buildings, I had a full Guild Hall, but Dylan shipped much more. Participants: Jon, Nadine, David K and Avraham, Binyamin and Zvi Yehuda, Ben and four kids, Roni, Michael and Elijah, Eitan and Emily, Mace and Shachar, Joel, Yosef, Saarya, Ori, Gili and Lotem, Yitzchak, Eliezer, Abraham and Sarah. Avraham is David’s kid. Zvi Yehuda is Binyamin’s kid. Roni is here in Israel for a year. Michael is Elijah’s father, and has come to other games days and nights. Mace is a friend who plays D&D, used to play Magic, and has come to games day before, with his son Shachar. Joel is a friend of Roni and lives in the area; first time here. Yosef has come a few times before. Ori is a friend of Saarya’s. Lotem is Gili’s kid. Yitzchak is a former regular who moved to Beit Shemesh. Eliezer is a Beit Shemesh regular. Sarah is Abraham’s wife, and has also come on occasion. We didn’t have a second sukkah this year, so games were played both upstairs in the sukkah and down in the apt. It was a fairly hopping day, and things went off smoothly, for the most part. The burger place even got our large complicated order correct. Games are presented in alphabetical order, rather than the usual chronological. I asked Binyamin to bring this, but I didn’t get to play it. Yay, I got to wipe the floor with two more newbies. Mace didn’t like the game after he found out there were no dice in it. Also, he kept trying to figure out why he couldn’t do several actions in a single turn, instead of having to use the rondel thingie. It’s timing threw him off. I played unusually aggressive, built a large fleet and destroyed everyone else’s temples and cities. First play for everyone. The Cylons won, revealed. I began sitting in as we tried to learn the rules of the game, but the rules were so complicated and so poorly organized that I ran out of patience. It took nearly an hour and we still didn’t know what was going on, and I hadn’t had my turn yet. So I gave my seat up to Joel. The game looked interesting enough, however, and once they got the rules down, it flowed fine, I hear. Some hands were played, with Mace joining at a later time. Levana, one of Ben’s kids, taught Eitan and Emily how to play. Apparenly not too well, and they reported that it seemed like she was making up rules as the game went on. They’ll need to try it again, I think. Saarya played Zeev, one of Ben’s kids. Throughout the day, various people played this, generally the children. The Chess set is made of plastic figures from Star Wars Episode 2. First play for Eitan, which explains why he let me win by inviting me to ally with him when it gave my my fifth base. I took over for Ben when he had to go out for a short while. Changeling and Filth were both in the game. All of the others had super powers: Vampire, Fungus, Void, etc. Binaymin won with Crystal while they were all fighting each other. We started Games Day with this. The set included tons of powerhouse cards, including Chapel, Cellar, Village, Festival, Smithy. I Chapel’d away my three Estates on my third round, and bought four Festivals, the others got 3, 2, and 1 Festival. When I won, they all complained that I won because of my 5/2 start, though none of the others took Chapel. So we played again with the same set, and we all agreed that each person had to start 4/3. The others took Villages and I took Chapel. And I once again began fine tuning my deck, first dropping three coppers, and then three Estates. This time I didn’t get Festivals as fast as the others, but it still looked like I was winning. Turns out that Ben, with his Bureaucrat squeaked in a win with a final victory point. Beats me how he did it. They played this again later. Played later in the day. After paying, Nadine declared that she doesn’t like the game, because other players can simply play your entire turn for you. Played as an opener. I think Zvi Yehuda hadn’t played before. I was going to play Magic with David, but Roni ended up playing instead. Later, Ben and I took random cards and made decks. Mine was a killer deck with black creature kill, red damage splash, and white flyers and soldiers. Ben’s was less killer, shall we say, but did have that incredible Equipment that gains a +1/+1 counter every time its wearer deals damage, which is practically a game ended in and of itself (in fact, David and I won’t play with in sealed). Even with my better deck, I only squeaked out a victory over Ben in the first game. David took over for the second game, and he had less problems, apparently. First play for everyone. Binyamin brought and taught it. I had never even heard of it. Played to end game night. First plays for Emily and Eitan. Emily was off to a great start with double park on turn 1. But Nadine’s cars and cube swapping powers swamped us all in mid-game. Just in round 6, I think she netted some 25 points. Emily said that this was her favorite game, so far. Gili taught this to Ben’s kids. I asked Nadine to bring this as I figured correctly that it would keep littler kids amused throughout the day. First game for Mace and Shachar. Five players is a tight game, and the auctions were difficult. I thought I wasn’t doing too badly, but I had to go back 5 points for get a second Jester that I desperately needed. Ben won nearly every game today, I think. First play for either Yosef or Ori, or both. They scored 39 and 35. Close game. First play for most of the others. Abraham is nearly unbeatable at this, having played several hundred times online. This was played early in the day. These guys played this near the end of the day. And then they played again. And again. This time without the expansion, I believe. An exciting game of this was played toward evening. I began with Rock, forgetting that that’s an all too common opener. It still beat Michael’s Scissors. Then I did Scissors to his Rock. 1-1. After that things got tense for several milliseconds. We both did Scissors, and then I did Scissors again to Michael’s Paper. 2-1 for me. I did Scissors again to Michael’s Rock: 2-2. We then tied again Rock to Rock, and finally, Michael brought out a Paper to my Rock, clinching a hard-won victory of 3-2. Close game, though. Played as a games day opener, first play for Eitan and Roni. Ron had previously played Puerto Rico, however. Amusingly, this was being played at the same time as Battlestar Galactica, occupying both tables in the sukkah. Binyamin taught this to Zvi Yehuda, but they stopped in the middle.